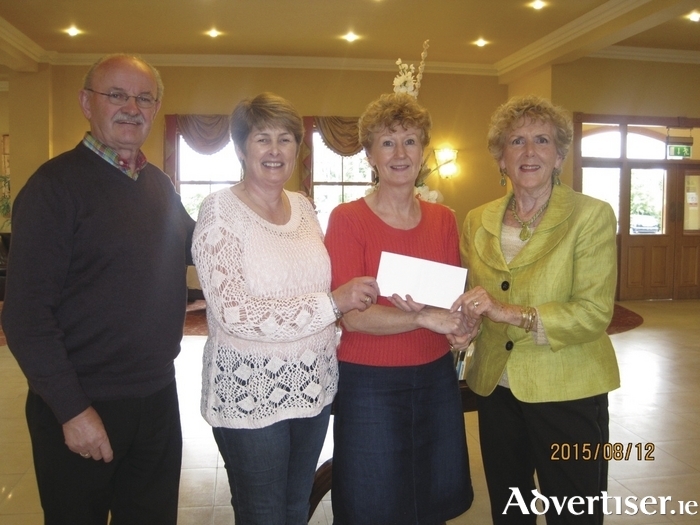 Pictured at the cheque presentation in Hotel Ballina of €1,200 raised by members of the Mayo Association of Toronto, Canada, to CEO of Mayo Roscommon Hospice Cynthia Clampett, were from left Jim Kelleher, Valerie Rowland, Cynthia Clampett, and Mary Kelleher. Mayo Cancer Support Association are holding a talk on Nutrition and Diet in Rock Rose House on Wednesday next, September 30 at 7pm. All are welcome. Call (094 ) 9038407 for further information. Aglish Boxing Club was set up in 2013 and since has been growing from strength to strength every season. With a growing number of talented young fighters, these are exciting times for the club and with the new boxing season on the horizon, Aglish Boxing club are looking forward to a new season with some future stars in the making. The club is based in MacHale Park Industrial Estate and boasts a spacious boxing gym equipped with male and female changing rooms, platform boxing ring, punch bags, floor to ceiling ball, weights, medicine balls and general exercise equipment. The club caters for both male and female boxers from ages nine and upwards. Training three times a week in their gym, Aglish Boxing specialises in training general boxing skills such as footwork, upper body strength, speed and boxing technique. The club would also like to thank all the local businesses who helped with sponsorship over the past couple of years. For more information, Aglish Boxing Club can be contacted via their Facebook page. A Meditation programme will commence in Ballina Family Resource Centre on Tuesday, October 6 from 10.30am to 11.30am. Mayo Cancer Support Association is running this programme, numbers are limited so please put your ring and book your place with Annie / Jean on (087 ) 2804164. A talk on the services provided by MindSpace Mayo will take place on Wednesday September 30 at 7.30pm in Cúram Family Centre, Claremorris. MindSpace Mayo supports young people aged 15 to 25 years with support around their mental health and wellbeing. Peadar Gardiner, project manager of MindSpace, will talk about the supports available to young people and their family members. This talk is open to all. To book places contact Cúram on (094 ) 9362096. Straw, hay, and rushes in Irish folk tradition will be the topic of the next Westport Civic Trust lecture, by Dr Anne O’Dowd, on Thursday October 1 at 8.30pm at the Westport Coast Hotel as part of the Westport Arts Festival. Organic materials, such as straw, hay, and rushes are freely available in the landscape and were used over the centuries to make useful and ceremonial objects. This talk by Dr Anne O’Dowd looks at the historical context of the making of a wide range of objects and the folklore of belief and custom connected with the materials and practices. Entry to this event is free. For more details call Pip Murphy on (087 ) 2663423. Cara Iorrais men's monthly meetings will commence again on Wednesday October 7 at 8pm in the Cara Iorrais Cancer Support Centre, Church Road, Belmullet. Foxford Alzheimer's Daycare has recently been chosen as the charity of choice by Knockmore/Foxford Boxing Club (KFC ) which intends to run a white collar boxing fundraiser on Saturday October 24 in Hotel Ballina. Support is needed from businesses/clubs/groups/organisations, etc, in the Foxford and surrounding areas to nominate a willing person (male or female ) to represent their business in the event. Every boxer will be fully trained and will undergo at least weekly training sessions to get boxing fit for the event. It is a great way of meeting new people and getting involved in a very worthy cause. Contact Frances on (086 ) 0630900 for more information. Adult swimming lane training will be recommencing with a new six course starting on Monday September 28 at 7.10pm with Paul. Zumba will also be recommencing on Tuesday October 6 at 7pm. Tuesday October 20 is a date for your diary if you wish to start your child in swimming lessons with the nine week swim development programme. The centre is also running a four day intensive swim lesson course for children, from level one to level seven during the October school half term from October 27 to October 30. For more information call (094 ) 9371313. Morning and evening classes will soon commence at Cúram Family Centre. Classes for this term include furniture upcycling, tai chi, yoga, Pilates, art, Alexander technique, sewing, meditation/mindfulness, parenting, and relax and refuel mind and body. For more information contact the centre on (094 ) 9362096. Operation Trans-Agha-Mation (OP-TAM ) is a community based fitness initiative, being organised in conjunction with Aghamore GAA Club. Over eight weeks, starting on Tuesday October 20, the OP-TAM programme will deliver a fun and energetic fitness programme for the communities of Aghamore, Knock, Tooreen and Kilkelly. The course will run every Tuesday and Thursday evening, and on Sunday mornings there will be a full schedule of classes with circuits, Zumba, yoga, Pilates, and more, as well as a Couch to 5k running/jogging programme. OP-TAM will finish on Saturday December 12 with a 5k fun run in Aghamore. The OP-TAM programme is open to over 18s. There will be a registration and briefing evening in Knock Community Centre on Saturday October 3 at 6pm, to include an overview and introduction with guest speakers. The cost for the eight week programme will be €60 per person, with the 5k race costing €10. Proceeds will go to Aghamore GAA club with a contribution to Mayo Roscommon Hospice. For more information contact James on (086 ) 8568143 or Joe on (086 ) 2938-216. A fundraising Climb a Hill for Jack and Jill will take place on Sunday September 27 from Aughalasheen NS, climbing Tower Hill, starting at 2pm. Sign in starts at 1.30pm at the school. Donations will be taken on the day. Last year 80 people took part in the climb and it's hoped that more people will take part this year. Connacht Pioneers will host a mini-vigil in Knock Shrine on Friday September 25 from 8.30pm until midnight. All are welcome. A reunion is being organised for the Convent of Mercy National School Claremorris pupils who won their first All-Ireland Marching Band Fleadh title in 1974. Plans are being put in place for the event which will take place in Claremorris on Saturday October 17. A committee has been working hard to bring together all the past pupils of fourth, fifth, and sixth class who were in the band in 1974. It is planned that all past pupils will meet in the school at 4pm, where they will be welcomed by the school principal and committee members. Later everyone will continue to the McWilliam Park Hotel for a meal at 6pm, and will be free to socialise and hopefully have the time and opportunity to catch up and reconnect with old classmates. While every effort is being made to contact everyone directly, the committee is hoping that relatives and friends who read this will help spread the word. In order to have numbers for the hotel, this will be a ticket only event; tickets are priced at €35 and are now available locally from Heffernans Foodstore, Ballyhaunis Rd/Silverbridge Shopping Centre, or PJ Byrne's bar/grocery, Main Street, Claremorris. The organising committee will also mail tickets and full details can be got by phoning (087 ) 7443537 or (087 ) 6397101. Diabetes Ireland is running a free education course for people with type 2 diabetes commencing on September 29 in Ballina Family Resource Centre. Booking is essential as places are limited. For further information contact Regina on (071 ) 914 6001. Some places are still available on the VTOS programme in Belmullet. If you are over 21 and on Social Welfare you could be eligible to join and gain new skills and new friends while keeping your payment. For more details or an informal discussion ring Theresa on (097 ) 20901 or email [email protected] or call in to the VTOS office. There are a number of upcoming courses taking place in the Family Centre in Castlebar. On Saturday September 26 there will be a Transform your Life through Christian Meditation course. Enneagram part one will take place on Wednesday September 30, and mindfulness for stress reduction will take place on Tuesday October 6. For booking or further information call the Family Centre at (094 ) 9025900 or see www.thefamilycentre.com. Parents or guardians who require more information about the club, or wish to enrol a young person into Louisburgh Foróige, are asked to attend the enrolment/information night in Louisburgh Town Hall on Tuesday September 29, between 8pm and 9.30pm. Only parents and guardians are required to attend. Young people are welcome to come along but should not attend without a parent or guardian. No registration can be completed and no forms can be collected on the night by young people themselves. If the date/times given above do not suit you, then feel free to contact Foroige, via its website, to make alternative arrangements. Visit www.louisburghforoige.com for more detailed information on this year’s enrolment. To enable Cong Foróige to continue, it is vital that there are an adequate number of leaders for the young people involved. If you are over 18 and have four to five hours to spare each month the club would be delighted if you could volunteer. Leader training is provided as well as opportunities to train for other programmes within Foróige. Contact Marian at (087 ) 6685926 if interested. A common sense parenting training programme will run in the Le Cheile FRC, Tucker Street, Castlebar, starting on Tuesday September 29. The course will run from 10am to 12 noon for seven Tuesdays. This programme is for parents of toddlers and gives them effective discipline skills and how to be more positive with their children. To book your place contact (094 ) 9025126. The 25th annual Run, Walk and Roll (formerly the Terry Fox run ) in aid of cancer research, will take place on Sunday October 11 at 12 noon. The event will start and finish at the Ballina Athletics Track and entry for the event is only €10 per person or €15 for families. Each competitor will receive a specially designed T-shirt and a one-off medal. Sponsorship cards are available from Michael Rice, The Shoe Hospital, Bridge Street, Ballina, or by calling (087 ) 6611975.